Last year I was visiting the National Museum of Scotland on a day out in Edinburgh when I came up against one of Gerard Quenum’s sculptures for the first time. I find that art produces several different types of positive effect in me if I like it. Sometimes it’s a technical appreciation, sometimes it’s a sense of connection with what the artist is representing or trying to say. And sometimes there is something deeper, something where the visual elements of a piece of work combine to create messages, messages which touch our own visual memories which are connected to experience. These are the pieces of work which you can never forget, which can even come to superimpose themselves over your own emotional memories as a kind of synthesis of all the things which that piece connects for you. For me straight away the sculpture brought vividly memories of my childhood home Nairobi and the city’s copious rubbish dumps, bits of coloured plastic, broken toys, and mangy dogs, but also of the many traditional tribal dolls which as a backdrop were ever present images when I was growing up in one way or another. I remember staring up at this piece and feeling the sensation of fire burning, charring the wood and the plastic, and knowing that this was a piece of art and an artist that I was not going to forget in a hurry. Quenum was born in 1971 in Porto Novo, Benin and is part of a movement of francophone African artists now starting to receive international recognition for their work. Quenum’s work has risen from a form of street art springing out of Porto Novo and Cotonou where spontaneous exhibitions are organised in the city streets. This “Boulev’art” (Art on the Boulevard) is beginning to gain international popularity and Quenum now has a considerable list of joint and solo exhibitions on the national scene under his belt. As well as exhibiting in Benin and other African countries such as Senegal and Togo Quenum has also exhibited in London, France and Brazil. It isn’t hard to see why Quenum’s work has enjoyed some success. Whether you love it or hate it there is no denying that these altered dolls are both striking and memorable. I suppose on some level it saddens me that the first reaction people seem to have to the pieces is “that’s weird” or “freaky” or some such thing. Whilst it is obvious that these pieces are meant to have some unsettling effect, it is a shame to see so many people dismiss the work as an attention grabbing gimmick when there is so much behind this work. Quenum’s work is produced almost exclusively using reclaimed and repurposed materials, most notably wood and bits of old dolls. The dolls, almost always originally white baby dolls, then undergo a transformation process, usually using fire to blacken their skin and to frizz up their hair. These alien baby dolls, given to African children, are being transformed into something which resembles to a greater extent these children. They are also being transformed into something which many times resembles traditional African dolls or masks, whilst always at the same time retaining something incongruous. It is this incongruity which makes people uncomfortable but it is also what makes Quenum’s work so hauntingly beautiful. There is a disturbing lost innocence about these reworked dolls, something which makes them both comforting and potentially terrifying. I suppose another thing that they brought immediately to my mind were child soldiers, innocent faces, scarred and marked by the histories of war torn countries. Can innocence exist where situations of extreme exploitation of the human being exist? La Vendangeuse (The Reaper) above perfectly illustrates this for me. The doll here is joined by another familiar childhood figure for Europeans, a stuffed Disney Tigger toy, but it is totally out of place. The elongated hooded figure reminds me of the many nomadic herds people who are so common a view in many African countries, and the children who are so often occupied with looking after their livestock, carrying their blankets around with them to sleep with the animals. However there is a darker side to this, The Reaper, is also death. The face of innocence in conjunction with the concept of the Grim Reaper calls to mind again for me child soldiers, agents of death hiding behind unexpected guises. 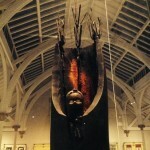 Quenum’s work is well worth a look at and if you happen to be travelling through Edinburgh go and see the real thing. At the least its something totally different, at the most it might be a new obsession. This entry was posted in Blog Home, Gallery, Sculpture, Ideas & Inspiration, Profile on Artists, Articles, Artists and tagged sculpture, african art, national musuem of scotland on February 22, 2016 by Fiona Machugh. Dutch Portrait painter, Ben Lustenhouwer, paints with Rembrandt materials only. Ben has become more and more known for is portraiture. Because of this he is gaining many more commissions from countries like countries like The Netherlands, Germany, Spain, Belgium, France, Switzerland, England, Finland, Russia, Mexico, USA, and China. His career as an independent artist started in 1972 while visiting the academy of art in Utrecht. Ben studied drawing and anatomy at a very early age with the renowned Beatus Nijs in Hilversum. With this foundation it is no wonder he can produce such beautiful and talented portraits. 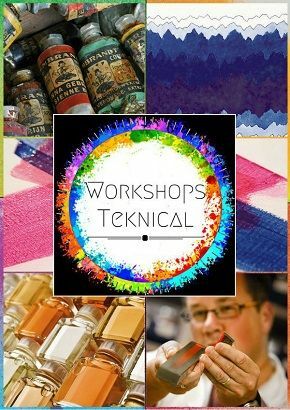 See more of his work on his website and learn what techniques he uses and more. This video above shows him using the Rembrandt Oils and how to paint a portrait of this little girl he has done. This entry was posted in Videos and tagged art, oil paint, rembrandt, portrate on February 16, 2016 by Natalie Jane Wallace. Our latest Artist’s Profile for our readers is with Libby Page. Born in Bath in England Libby is currently resident in Narbonne, Languedoc Roussillon, France. Libby has a BA in Fine Art specializing in sculpture from what was the Wimbledon School of Art (now Wimbledon College of Art). 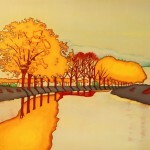 Libby currently has professional affiliations with galleries Inspiré in Azille, Southern France ( https://www.facebook.com/InspireAzille/) and Vue Sur Cours, Narbonne, Southern France (http://www.vuesurcours.com). She has also exhibited in Lyon and the UK but works mainly with private clients. Moving to the south of France nearly ten years ago revived the passion for colour that I’ve had since I was a child. As I travelled within the region I found myself asking how I would mix up the colour of this cloudless blue sky, the riotous autumn vineyards, the bright spring poppies or the distant mountains. Finally it was the Canal du Midi with it’s beautiful tree-lined banks that pushed me to take these colour-filled musings and try attempt to pay homage to the splendour that was all around me. The Canal, as we know it today, is coming to the end of one glorious chapter as it’s majestic plane trees are being felled due to disease. So, not only was I stirred by the Mediterranean colours and the trees whose architectural forms resonated with the sculptor within me, but now I also had a deadline; these trees are coming down fast, each year the canal-scape changes. It is still very beautiful as new vistas are now opening up which were once hidden, but it is changed. So at first glance it seems apparent that I am a landscape painter, but there is also a hidden message within the work. Each colour has a meaning of my own invention. So as I paint, I am telling a story or remembering a moment. It is a way of writing in code, my secret diary. 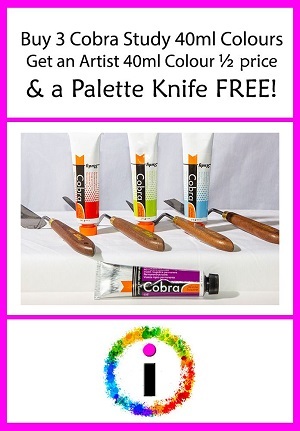 Used to working with traditional oil paints, I am now making the switch to Cobra, water mixable oil paints. The transition has been easier than I thought because the most important thing for me is colour and they are so good. One of the best sap greens I have ever used! I’m a fan of translucent paint and they match up to their traditional counterparts 100%. The difference has been one of texture. Oil paints have a sumptuous fluidity which is less evident in the Cobra paints. However, a little medium, (or a little water!) soon fixes that. The relationship with Inspiré in Azille started when a friend of a friend told me about them. I met the owner, Angela Saunders, four years ago and liked both her and her vision for the gallery from the start. She is a pioneer of fine art in a region that is mostly devoted to the more natural pleasures that the land has to offer, namely wine! I have only recently been approached by Vue Sur Cours, Narbonne. The owner, Claude Tassus-Bauléry has seen my work evolving over the last few years and wanted me to be a part of her portfolio when she opened her new space in the centre of Narbonne. Very exciting! If from a traditional art background (i.e. higher education in art) how do you think the institutions you were associated with have formed/ informed your practice? I think my most formal lessons were learnt before my higher education started. The fundamentals of colour mixing I learnt at school and the disciplines of constant observation and a disciplined drawing practice I learnt during my one year foundation course. My higher education taught me how to talk about my practice and how to understand what I am doing now in the context of art history and the wider contemporary scene. After that, a job working in an art gallery gave me a glimpse into seeing things from the other side; a comprehension of what people like to buy and also the confidence that it is possible to survive as an artist. However, we learn every day and from every experience. You can be a great artist with no formal training at all. Andrew Fraser, Errol Le Cain, Otto Dix, David Elgey, Paul Cezanne, André Derain, Francis Bacon, Simon Müller, Barbara Hepworth, Yoko Ono, Edmund de Waal, Ronald F Smith, David M Martin, Domonic Hills, David Hockney, Peter Doig. Externally, the Canal du Midi and the light of Southern France. Internally, my faith, my questions, my observations and reactions. I have a wee room in my home, 3m x 4m. North light and neighbours peep through the window. I’m beginning to outgrow it now but it has been so nice working at home with my cat. If you are nervous, it shows that you care. If you want to be good, don’t give up practicing. If something seems impossible, carry on practicing until it is easy. Wear many hats. 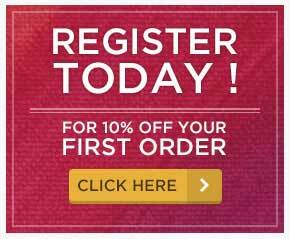 Once the first hurdle of learning how to make your work well has been leapt over you will still need to learn how to market your work and plan your time effectively to meet demands from galleries or private clients. Enjoy it. Or stop. There are easier ways to make a living! What do you think is the importance of art to society? This entry was posted in Blog Home, Ideas & Inspiration, Profile on Artists, Articles, Artists on February 8, 2016 by Fiona Machugh.